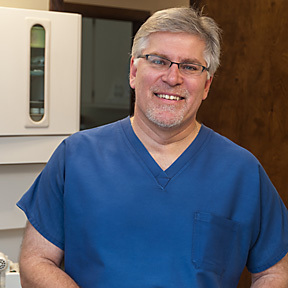 Dr. Peter A. Zaidel has been practicing general dentistry in Cromwell, Connecticut since his graduation from Georgetown University School of Dentistry School in 1986. The Georgetown University maxim of; “the most important step in any procedure is the one you’re working on” drives his team’s goal of providing care that will look great and stand the test of time. He initially worked in the group practice, The Dental Group, prior to acquiring the practice of Dr. Gerhard Weidler in 1992. He takes great pride in the good number of patients he continues to care for from those “Dental Group” Days. Dr. Zaidel is an active member of the American Dental Association, The Connecticut State Dental Association, serving as a past delegate, and the Middlesex County Dental Society, serving as past president and currently serving as long term secretary. He lives in Higganum with his wife, two grown children and their golden retriever. Dr. Zaidel is a Civil War buff, and is currently working on a book on Connecticut Civil War soldiers with Dione Longley entitled “Hero’s for All Time.” He has also served on the board of the Middlesex County Historical Society for over twenty five years. He subscribes to the “keep the parts moving” philosophy and enjoys running, biking and playing golf. Our hygienists, Kim (joined in 1997), Elwira (joined in 2000) and Jolanta (joined in 2004) are highly skilled, competent and caring. 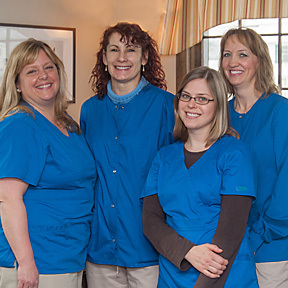 They have a great rapport with all of our patients and will always do their very best to make you as comfortable as possible. They are licensed with the state of Connecticut, and each participates in continuing education annually. They are dedicated to increasing their knowledge and professional skills to benefit our patients. Christine (joined in 2004), Dr. Zaidel’s assistant, is x-ray certified and helps Dr. Zaidel deliver the highest quality of care. She takes every measure before, during and after treatment to assure that patient care is as pleasant as can be. 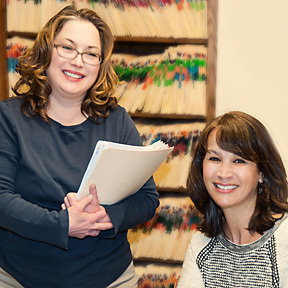 Jill and Cathy (both joined in 1992), our administrative staff, will welcome you when you enter the office. They can answer any questions you have from scheduling, to financial and insurance issues, as well as routine dental concerns.